Brake inspections or repair, we strive never to stop short of excellent service. 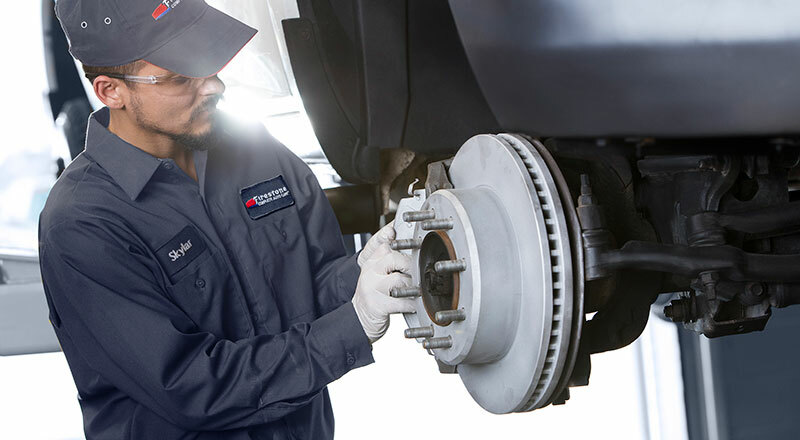 Visit Firestone Complete Auto Care near you for the right brake service in West Saint Paul. Do screeching brakes, a spongy pedal, or weak stopping power have you in desperate need of West Saint Paul brake specialists? Firestone Complete Auto Care is the place to go when you need brakes for less than the other guys. Thanks to our easy-to-download brake coupons, you can pay less for the brake services and repairs you need to keep you safe on the road. But how do you know when it’s the right time to stop by? Watch out for signs! Sounds, smells, and sensations can all signal brake problems. Eardrum piercing brake noises can point towards worn pads and shoes. Vibration in the steering wheel could also mean worn out brake pads, but possibly warped rotors too. Whatever the issue, your best bet is to get a brake check before things worsen, since the damage could spread throughout your brake system. Come to Firestone Complete Auto Care for complimentary brake inspections in West Saint Paul, when it's convenient for you. You can expect that our technicians will measure pad, rotor, and drum wear, along with the health of your brake fluid and e-brake. Then we'll walk you through any services that may need to be performed, like brake pad replacement, rotor and drum resurfacing, brake fluid change, or replacement of brake lines. Whether you need new rotors or calipers, you'll find that we're one of the best choices for brakes on a budget. We perform nearly one million brake repairs every year! Neglecting brake repairs is a one-way route to risk. Book an appointment at Firestone Complete Auto Care for brake service in West Saint Paul at the first sign of squeaky brakes, low brake fluid, or a loss of stopping power. Many of our locations have extended evening hours and are open on the weekends to make repairs more convenient. Drive with confidence knowing that because we did our job, your brakes are ready to do theirs. Visit us today! From drivetrain services to batteries to tire repair, trust your nearest Firestone Complete Auto Care for your auto service needs. We're your all-in-one tire store, car care center, and automotive shop. Our skilled technicians work hard to help keep your vehicle performing its best. Regardless of the maintenance your car or truck needs, we will strive to make your visit satisfying. Explore our services and at your convenience, schedule your next courtesy check or repair in West Saint Paul, Minnesota today.